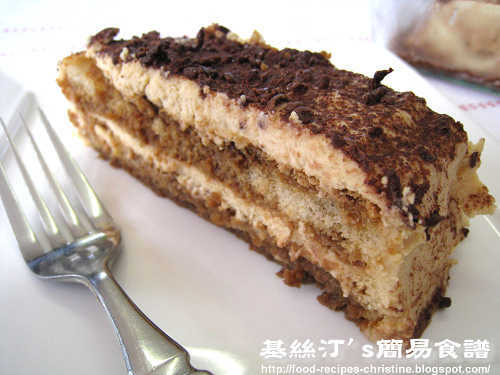 I wanted to learn and make Tiramisu, one of the most popular Italian cakes for a long time. Tiramisu means "pull-me-up”,“cheer me up”. Indeed, the strong coffee and wine inside can really boost up our minds. Its taste is addictive and its look is fabulous. In a luncheon, a lady brought some Tiramisu to share. When she opened her Pyrex container, we were all amazed. The smell of her Tiramisu was so good and the taste like those bought from professional cake shops here. We begged for her recipe, of course. The traditional recipe of Tiramisu is made of finger biscuits, dipped in strong coffee, layered with a whipped mixture of eggs, mascarpone and sugar, and topped with cocoa. Raw eggs seem to be a must to add. 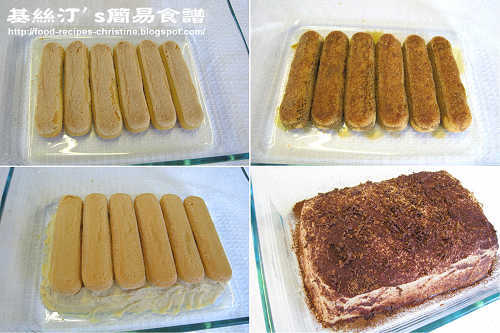 Yet, my friend experimented and created a new version of Tiramisu without using any raw eggs. It’s a good news to all of us who don’t quite have any confidence in eating raw eggs. The taste of this eggless version of Tiramisu remains as delicious as the traditional one. Best still, it’s pretty easy to make. My friend’s 13 years old girl can make one to surprise all people in a party. Dissolve instant coffee powder in hot water. Let cool. Stir in half of the marsala wine and chill in fridge. Beat cream and icing sugar mixture in a large bowl with an electric mixer until soft peaks form. Fold in mascarpone and remaining marsala. Dip half of the sponge finger biscuits, one at a time, into the coffee mixture and arrange as a single layer on a 6 cm deep serving dish. Spread half the cream mixture on top of the first layer of biscuits. Dip remaining biscuits in coffee mixture, arrange over cream layer. 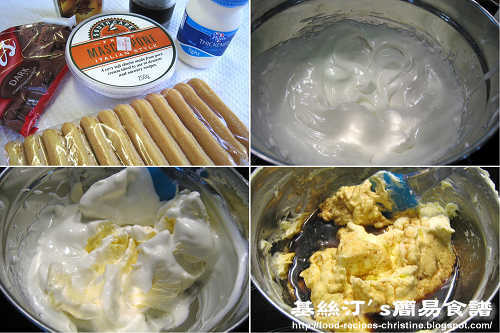 Spread remaining cream mixture on top of the second layer of biscuits. Sprinkle with chocolate. Cover and refrigerate for about 6 hours. Served with cocoa powder if you desired. Use chocolate powder instead of grating chocolate for convenience. Try not to over soak the biscuits. When done, there should be coffee mixture left unused. Use light thickened cream instead if you like. Beating light thickened cream is a bit more difficult than beating thickened cream and takes longer time, yet with healthier results. If you find it’s quite hard to place finger biscuits evenly after they are soaked and turned soft, you can use this alternative way: arrange the biscuits first, then use a tablespoon to sprinkle the coffee and wine mixture. If you have young children and they don’t like any wine in this dessert, you can use Ribena (blackcurrant fruit drink) to replace the wine. One of my friends finds her daughter likes the taste very much. That’s a kid-friendly version. Thanks for sharing the recipe Christine - I am also not a fan of eating raw eggs - I always thought it was a must with tiramisu - am glad you found this recipe. wow this is an awesome recipe so good to see something that sounds safe and looks this delicious thanks for your thoughtfulness and sharing this awesome recipe! Your recipe looks delicious. I've only had this dessert once, and I loved it. I'll have to give this a try! This is so easy~ And I bet it will be crowd pleaser too. This looks like a very moist and delicious version of tiramisu. It's such a wonderful special occasion dessert. Wonderful pictures and amazing recipe! Great job on this tiramisu! Beautiful tiramisu. It's always my favourite. This looks like the one my friend made to share with me...no eggs....and easy to make. Thanks for sharing. I always want my baby to taste tirmisu, but with raw eggs? NO NO!!!!! Thanks for this wonderful alternative recipe. It sounds perfectly delicious! Hi Christine.. are you just assembling the tiramisu on a plate in those photos?? looks great! you are really good! your family must love your cooking! The thickened cream, we use here, is added a bit of gelatin. You can replace with whipping cream for sure. Hi, can I replace Marsala wine with rum? May I know how much gelatine to add to make thickened cream and what is icing sugar mixture? Hi Christine, this is a great eggless tiramisu recipe! May I know how can I whipped up the thickened cream and icing sugar? Check the ingredient labels on the packaging first. Some icing sugar products have incorporated a little bit of corn flour / corn starch to prevent from sticking together. It might be the cause. Hi Christine, can I substitute Masala to bailey? Traditionally, Masala wine is used. It helps to increase the fragrance and impart sweetness into the dessert. But why not? You can use any alcohol that you like as long as you love the fragrance. Test the sweetness and adjust with some sugar if you desire.